Vuvi Mask, Gabon via Sotheby’s. Hook-Mask, Bahinemo People, Hunstein Mountains, Papua New Guinea via Sotheby’s. 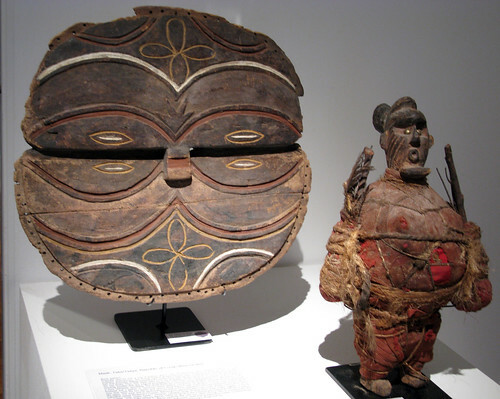 Bafo Mask, Cameroon via Sotheby’s. Mask, Teke/Tsaayi, Republic Of The Congo via Sotheby’s. War Canoe Prow Mask, Iatmul People, Middle Sepik River, Papua New Guinea via Sotheby’s. Zulu male figures (udoli) wearing imitsha made by Hluphekile MaMchunu Zuma 1990. Photo by Action Photos. Collection Frank Jolles. Zulu clay doll (udoli) Photo by Hershel Mair. Collection SAM. Zulu male figure (udoli) Photo by Action Photos. Collection Frank Jolles. Zulu woman figures (udoli) made by Hluphekile MaMchunu Zuma 1989. Photo by Action Photos. Collection Frank Jolles. Ovakwanyama, child from the palm fruit. Collection WITS-SFB 94.16.02. South Sotho clay doll collected by Revd Ellenberger pre 1870. Collection Museum of Mankind, London. Scans from Evocations of the Child: Fertility figures of the southern African region. Berber Mother and Daughter, Morocco Photograph by Carol Beckwith and Angela Fisher. Conveying blessings and bittersweet good-byes, a Berber mother in Morocco plants a kiss on her daughter’s knee as she gives her in marriage to a man more than twice her age. Days of feasting will weave into nights of singing and dancing for the bride, who has captured the liver—the Berber embodiment of love—of the man sworn to protect her. Maasai Wedding Day, Kenya Photograph by Carol Beckwith and Angela Fisher. A single tear marks the moment of farewell for lavishly beaded Nosianai as she leaves her family home in the Loita Hills of southern Kenya. Wedding-day tears may express true sadness among Maasai girls, who submit to arranged marriages with much older men whom they barely know. Rashaida Bride, Eritrea Photograph by Carol Beckwith and Angela Fisher. Veiled behind an elaborate mask called a burga, a Rashaida bride stays in seclusion before her wedding. The Muslim Rashaida are Bedouin merchants and camel breeders, originally from Saudi Arabia, who keep to themselves and marry only their own. 1935 Teke, originally uploaded by ann porteus, Sidewalk Tribal Gallery. Photographs by Hans Silvester from the Marlborough Gallery. Found via Asherah66. 4755 1 Ambo Lunda Doll, originally uploaded by ann porteus, Sidewalk Tribal Gallery. 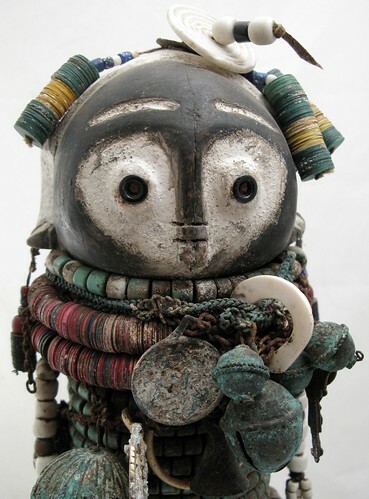 9944a Beaded Calabash Doll, Fali, Cameroon, originally uploaded by ann porteus, Sidewalk Tribal Gallery. 9882a Beaded Doll, Kapseke, Cameroon, originally uploaded by ann porteus, Sidewalk Tribal Gallery.